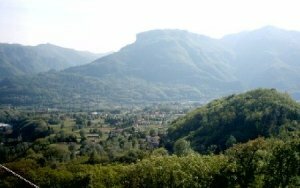 217 Apartment with pleasing views of the nearby river Lima and surrounding valley, located in Bagni di Lucca. The price of this property has recently been reduced. Apartment in Bagni di Lucca with terraced garden overlooking the river. This first floor apartment is 120mq. included is an independent terraced garden. The apartment consists of 3 bedrooms, bathroom, large kitchen and lounge plus a spacious landing. The property retains many of the original decoration from the 1800s on the ceilings. The front door, hallway and staircase are shared with the ground floor apartment. This common space is decorated with the original frescoes which give a pleasing period feel. There is a large shared basement where the two apartments house their boilers. The two apartments share the terrace gardens which are set on various levels, there are stone walls from which one gets splendid views of the river. The garden can be accessed via the staircase and via a private gate. Included in the sale is an ivy covered ruin of a former turret in the garden next to the river. The large flat is ready to live in it may perhaps need an upgrading of the kitchen. The property is within walking distance from bars, restaurants and shops. 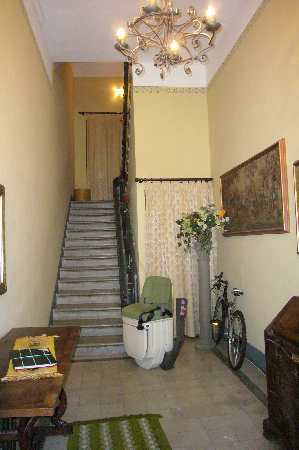 Flat situated within walking distance of the centre of Bagni di Lucca. Apartment with two balconies, set on the second floor, located in Fornoli, Bagni di Lucca. A fully renovated apartment situated in the historic centre of Barga. Charming town house in the historic centre of Coreglia Anteminelli. 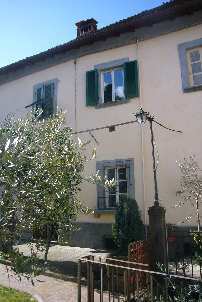 Pleasing ground floor apartment with walking distance from the centre of Barga.